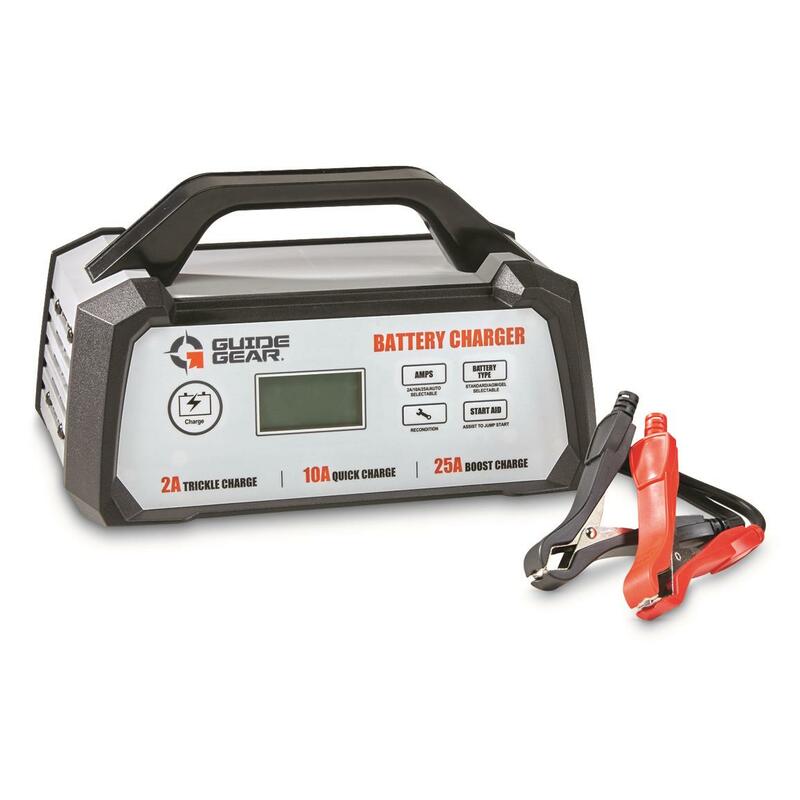 This Battery Charger is full of advanced, easy-to-use features that give you the options you need to keep your batteries charged. For instance, the battery type selector lets you choose between STD, AGM and GEL batteries and automatically detects the presence of a 12V battery. You can also choose from 2A, 10A or 25A charging rates. But more impressively, this unit is equipped with an engine start aid function that provides 3 minutes of boosting to get cars and trucks running. Equally impressive is the recondition mode which brings dead batteries back to life. 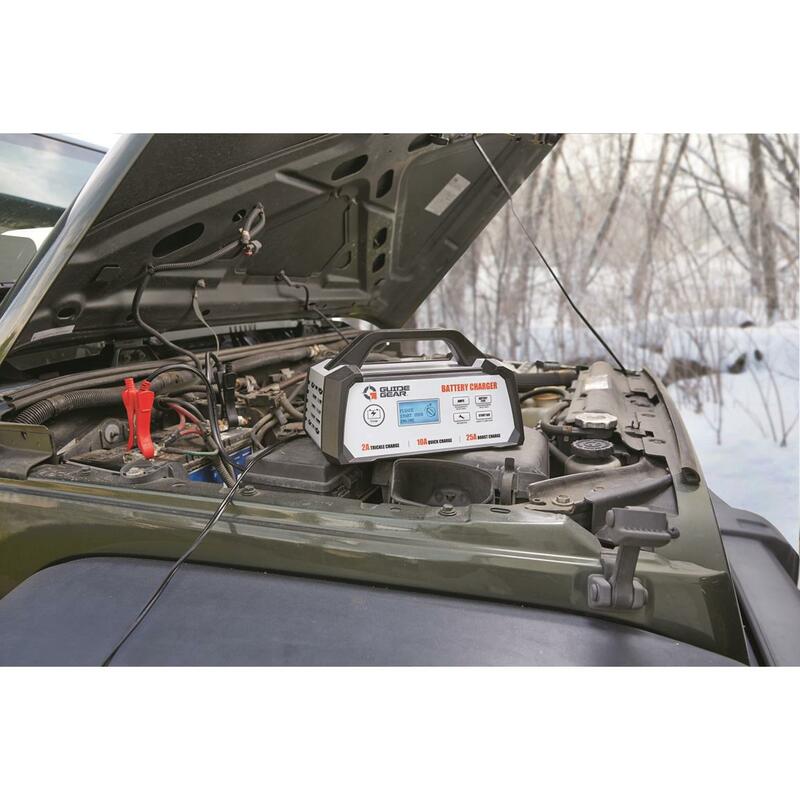 Finally, this unit is equipped with a battery and alternator tester which helps diagnose problems. That sure could come in handy! 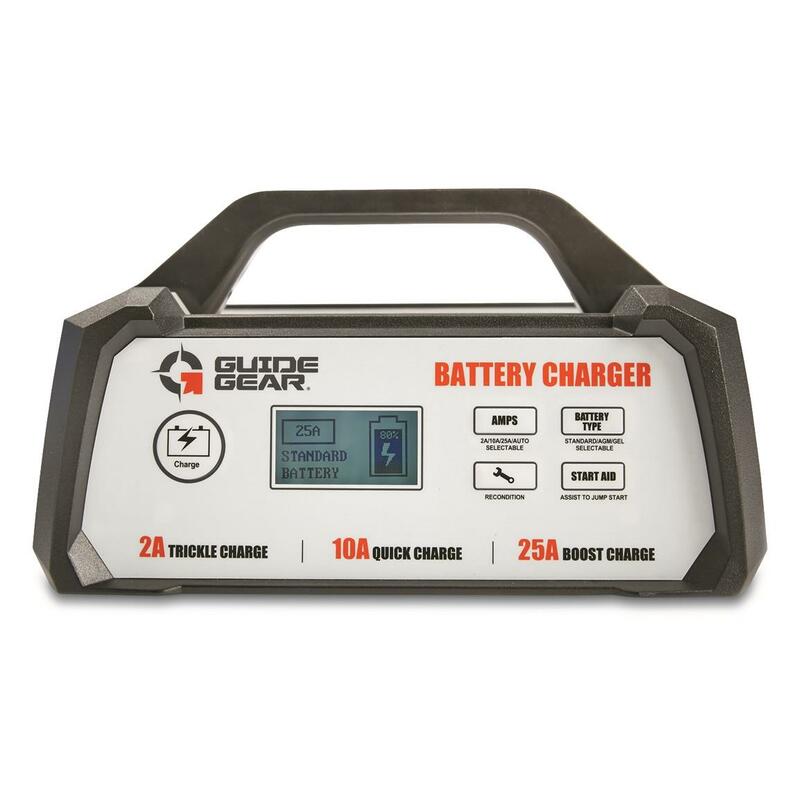 An interactive LCD display keeps you updated with all the vital stats, and the 6' long 12-gauge copper cables add to the quality and ease of use of this Battery Charger. Powerful and compact, portability is made easy thanks to the top carry handle. And not only is this Battery Charger full of features and simple to operate, it's safe, too. Put it to work without worry. You get protection from reverse polarity, short circuiting, overcharging and overheating. It truly is a Smart Battery Charger. NOTE: Always unplug and disconnect the charger before performing maintenance on the unit. After each use, use a dry lint-free cloth to clean battery corrosion and other dirt from the clips, cords and charger. Ensure that all components are in good working order. Never open the charger as there are no serviceable parts inside. The charger should be stored in a cool, dry place and in an upright position when not in use. Dimensions: 10.8" x 9.7" x 5.9"
Guide Gear 25A 12V Smart Battery Charger with Start Aid Function is rated 5.0 out of 5 by 1. Rated 5 out of 5 by olive from great price works great worth every dollar. Keep your electronics charged on the go.